KINGSTON, Jamaica – Amid calls by the parliamentary Opposition for the Government to reconsider its decision, the special legislation being crafted to sanction the decision by the Andrew Holness administration to retake Venezuela’s stake in Jamaica’s state-owned oil refinery Petrojam is expected to be unveiled in the House of Representatives next week. In fact, Jamaica’s Attorney General Marlene Malahoo Forte has revealed that the plan was to have the proposed bill tabled during yesterday’s sitting of the Lower House. Already, Malahoo Forte said the bill, entitled an ‘Act to Provide for the Compulsory Acquisition of the Shares Held by PDV Caribe in Petrojam and for Connected Matters’, has been reviewed by the legislative committee of Cabinet. “Regrettably, all the steps in the process prior to tabling were not complete in time for tabling today,” she told lawmakers in Parliament yesterday. “We expect to table the bill at the next sitting of the House,” Malahoo Forte added during a motion moved by Opposition Member of Parliament Julian Robinson. 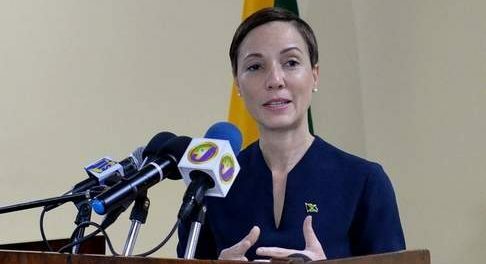 The disclosure comes a week after Jamaica’s Minister of Foreign Affairs and Foreign Trade, Senator Kamina Johnson Smith, first announced that the Holness administration would use legislation to retake the 49 per cent stake held in Petrojam by PDV Caribe, a subsidiary of the Venezuelan state-owned firm Petroleos de Venezuela (PdVSA). Two days after the announcement by Johnson Smith, Jamaica voted, along with 18 other member countries of the Organization of American States, not to recognise the legitimacy of Nicolas Maduro’s second term as president of Venezuela. Malahoo Forte defended the vote, saying it was “consistent with a principled position taken in Jamaica’s best interest”. “The actions of the Government will most likely lead to legal action being pursued by the government of Venezuela. Those actions can cost the taxpayers of this country billions of dollars that we may have to pay in restitution if a court rules against us,” he cautioned. Opposition Leader Dr Peter Phillips kept up his criticisms of the Government’s decision, asserting that both actions were premature and “indeed bring disgrace to Jamaica’s reputation. So we must wonder about the timing of such announcement and the question, is why choose to announce when the legislation isn’t even ready?” he questioned. “The fact is, we have never expropriated the property of any investor in Jamaica before. It is a dangerous precedent for us to set. If we don’t behave honourably to our friends, we soon won’t have any friends,” said Phillips in his comments on the motion. But Phillips’ comments triggered a sharp rebuke from minister without portfolio in the Ministry of Economic Growth and Job Creation, Daryl Vaz. “Bring back the state of emergency! Bring back the state of emergency! Jamaica first!” Vaz shouted to Phillips, in reference to the decision of the parliamentary Opposition to vote against the proposed extension of the enhanced security measure.